In this report from RTÉ News (Thursday 19th June) it appears that the problem of pyrite affected blockwork is more widespread than initially thought. Problem blockwork in a County Dublin residential development has been detected, with 4 houses so far requiring demolition. We are not aware if there are any further demolitions planned in this estate at this point, or if there are any other recent projects in Dublin affected. Four south Dublin houses are in the process of being demolished following the discovery of pyrite in the blockwork. The four and five bed units on Seaview Park in Shankill were being constructed by Orchid Homes but will have to be completely rebuilt because of the defective blocks. It is believed to be the same issue that affected houses in an estate in Moneymore, Drogheda Co Louth and a school extension in Argillan, Balbriggan, Co Dublin due to material supplied by a quarry in the Leinster region. The Shankill development consists of two detached five-bedroom houses and two semi-detached four-beds. 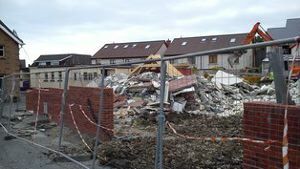 A spokesperson for Dún Laoghaire Rathdown Council said “the demolition of the houses was the builder’s decision following consultation with the block supplier and Building Control engineers”. Planning permission remains in place and it is expected that the houses will be rebuilt.